We are required to curate an online presence/persona and WordPress has provided the goods. Welcome to my online introduction to ‘Convergent Media Practices’. Industries, Audiences and Technologies will be explored and shared by me for all of you reading this. Join my BCM 112 safari! The #hashtag has been identified as a fundamental aspect in the world of social media, it acts as a catalyst in the development and activity of one’s online presence and persona. It has the ability to send droves of new audiences to your content and at the same time give you the opportunity to find your target collective. In this video I explore and emphasise the power in which the user generated sign (#) beholds and the ways it reaches out to from the micro public to the micro celebrities. As the technological world evolves around us it is expected that we learn it’s language and the hashtag is a key term in which will help us communicate to the world. 3) Marwick, Alice, boyd, danah (2011) ‘To See and Be Seen: Celebrity Practice on Twitter.’ Convergence: The international Journal of Research into New Media Technologies 17(2) 139-158. Virtual Reality & Digital Crafting? This podcast outlines the way in which material making and digital crafting have altered and converged through the media and have allowed the consumers to experienced things through a digital world rather than a physical and man-made. The Oculus Rift extends an individual across the gaming industry and places them in one that creates a new meaning and use of the platform. 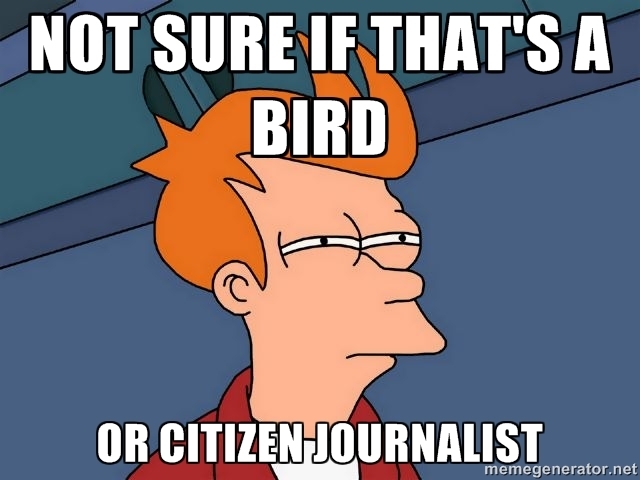 Citizen Journalism is when private individuals do what professional reporters do; collect, report and analyze content. We ultimately have media sharing circuits at the touch of a finger and can easily distribute content becoming the driven force between the audience and event. This the plays off McLuhan’s notion of “The medium is the message” whereby we are extending ourselves through converged platforms. Marvel has been in the Trans-Media game for quite some time and is one of the contenders most valuable player. The content whereby spreads through a number of platforms maximizes the amount of consumers intriguing them into an immense fictional world. I have refected this in my Prezi presentation exploring what Trans-Media is and how Marvel explores this notion. McLuhan’s term ‘The Medium Is The Message’ is greatly emphasized through this practice enhancing the engagement of audiences on many different level increasing an understanding of the text. Maintaining, interest, dialogue and stimulus. We’ve all heard that song where a rapper yells “REMIX” in the background, and that is just one tiny aspect of Remix Culture; allowing and encouraging derivative works within music, film, etc, by combining or editing existing content producing a new product. Though where did these products rise from? Remixes today are developed off one main foundation whereby it is then altered remaking and continuing the story. Mass audiences are taken into a realm of possibilities and imagination therefore continuing this remix domino effect. Though does this violate copyright? Weird Al Yankovic uses already establish work within in creations in music parody, though and majority of the time does not need permission from the original composers. Reason being that Weird Al’s work is protected by the U.S laws of ‘Free Speech’ and ‘Fair Use’ expressed here. Remixes in today’s media seem to have the right precautions whereby they are protected from copyright infringement, we as a generative audience desire to recreate and manufacture meaning but do not always have the right to remix and produce off a centered idea. This read and re-write cultured has well and truly incorporated McLuhan’s theory of “The Medium Is The Message” giving us the power to extend from a spoon-feeding and locked technological world. We are able to creatively voice our thoughts therefore creating not only an extension of our very selves but the original works built upon. In today’s technologically advancing world information is generated 24/7. Relevant or not you can find content on anything and everything. And with this transformation, and the idea of a passive audience; in that we sit like couch potatoes and are spoon-fed everything we come across. We are able to now decide and generate the information that appeals to us all through the power of the online world; we have shifted accordingly and turned into the generative public. This has therefore resulted in the dropping of support in legacy media whereby you can now witness what you see on the television and much more through this online persona. The line is blurred between the entrenched states of the ‘audience’ and ‘author’ where individuals can pick and choose. I have created this meme outlining the battle between Apple and Android; identifying ‘Locked Appliances’ and ‘Generative Platforms’. Locked Appliances are those that are restricted and firmly controlled by the manufacturer, they are tethered to a closed ecosystem whereby the device, content and users are limited. Generative Platforms are in no way on this bandwagon, and has no central control. The manufacturer has no governing control over the device and content the users desire. A locked platform; Apple continues to warn that hacking an iPhone and installing unauthorised software, although not illegal, Apple frowns upon and acts upon those who do. “When you buy an iPhone…Package deal that includes software, hardware, and a wireless contract”. Rooting an Android device is apart of it’s fundamental use, consumers are in full control of the software, content and applications with limitations whatsoever. What is the use of restricting platforms in an evolving technological world? Does this affect convergence? Jenkins, Henry (2004), The cultural logic of media convergence, International Journal of Cultural Studies, Volume 7(1): 33–43.